Tension levelers are typically used for leveling material by stretching the material into the elastic region. In order to achieve the high amounts of tension necessary, a tension leveler can utilize bridle roll sets that incrementally increase the tension into the main leveling zone and incrementally decrease the tension to the downstream process or recoiled. 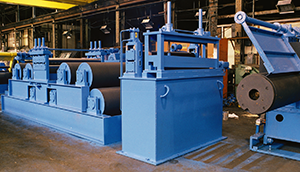 These bridle rolls are typically individually driven by regenerative motor systems that provide the necessary resistance to build tension. The main leveling zone can contain either a corrective leveler or temper mill to further remove flatness defects. Tension leveling typically provides the optimum correction of shape defects in metal strip but is limited in the ability to level thicker strip. Stacking sections are available to stack leveled plates into bundles for shipment. 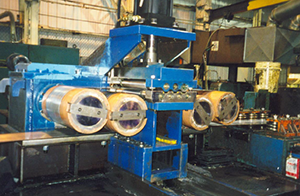 Variable roll geometry options are available to provide additional bending capabilities. Closed loop positioning control allows for generating machine setting recipes for common plate runs. A Leveler can be used to remove flatness defects from many different materials. Element Machinery has built levelers for correction of flatness defects in materials. The yield strength of the material also determines the overall size of machine necessary. How can we help you? Give us a call (855) 447-7648 or send us a message here. Element provides automated equipment and assistance to fit the unique needs of our customers spanning multiple industries. Check out our Products and Services for more information!